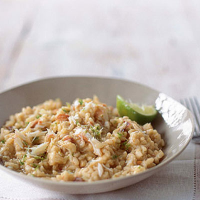 This rich risotto is livened up with hints of chilli and lime. Cromer crab is caught off the Norfolk coast and is known for its exceptional meat that's delicate and sweet. In a large saucepan, bring the fish stock mixed with 750ml of water to the boil. Meanwhile, finely chop the onions and heat 1 tbsp olive oil in a large, deep, lidded non-stick frying pan. Add the onion on a low heat (lid on) for 3–4 minutes until soft, stirring occasionally. Add the rice, crushed garlic and ginger and stir for 1 or 2 minutes until fragrant. Add half the liquid (stock and water) and cook for 8 minutes, stirring occasionally. Scoop out all of the crab meat from the shell, reserving the nicest pieces to garnish, and stir in the rest with the remaining stock. Cook for a further 8–10 minutes, adding a little boiling water if needed, until the rice is tender. Stir in the chilli, lime juice and half the zest. Season to taste and serve garnished with the reserved crab and lime zest.